We left Toronto on April 15 and flew to Göteborg, Sweden, then drove a rental car north to the island Tjörn where we had left Pilgrim, on land, over the winter. Scandinavia had a beautiful early spring; the daffodils and forsythia were in full bloom and the birch trees were in bud. All evidence of a hard winter had melted away leaving our exterior teak in a dismal state of repair. However… speaking of snow, we got the Baltic Sea Ice Report every day until the end of May. It seems there was still 15 cm (1.5 feet) of ice in the Bay of Bothnia between Sweden and Finland. Icebreakers were still on patrol. 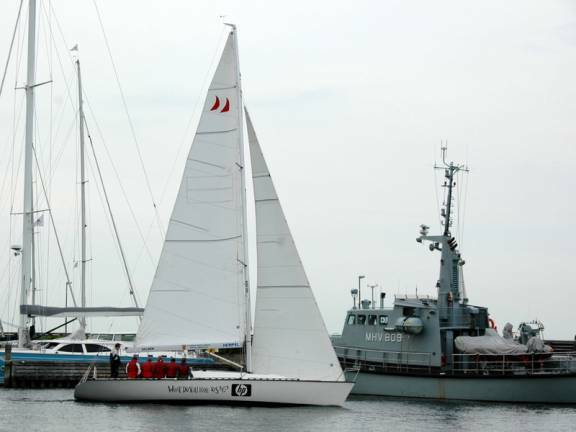 We launched and prepared Pilgrim for our 2009 voyages then left Tjörn on May 1. Our first mission was to get to Norway. Strict importation regulations in the European Union prevent us from staying longer than 18 months in the EU if we want to avoid paying Value Added Tax on the value of the boat … up to 25%. Since Norway is not in the EU, we headed north to get official documentation that we had left the EU. 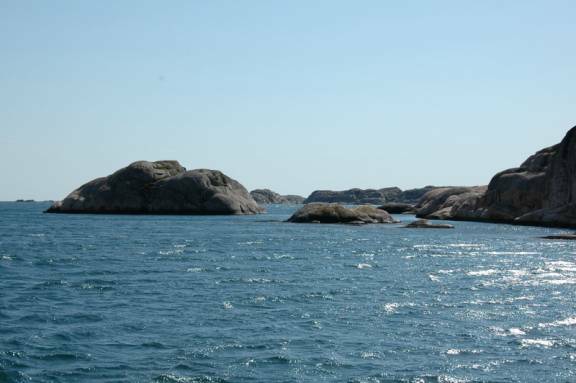 Luckily the west coast of Sweden north of Göteborg is lined with islands and rocks that form an archipelago that provides protection from gale force winds. 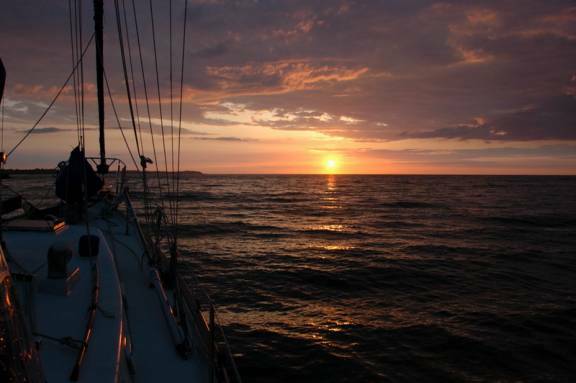 We had great weather and winds, sometimes we sailed outside the archipelago, and othertimes we made our passage in the buoyed channels inside the archipelago. 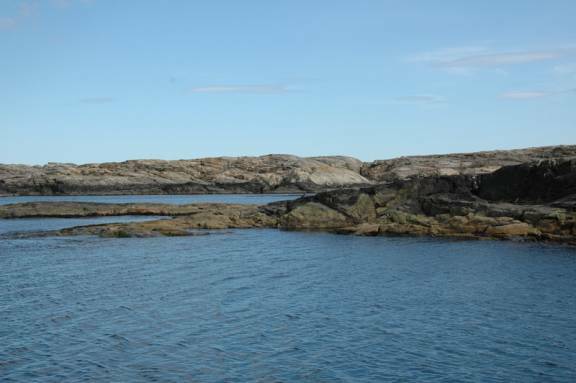 The archipelago is not as lush as the Stockholm Archipelago on the east coast. It is similar to the Bustard Islands in Georgian Bay … some low trees and shrubs, lichen and wildflowers, but mainly low, rolling rock. There were a few small villages we ghosted through under sail; it was like taking a stroll down the main street of the village. 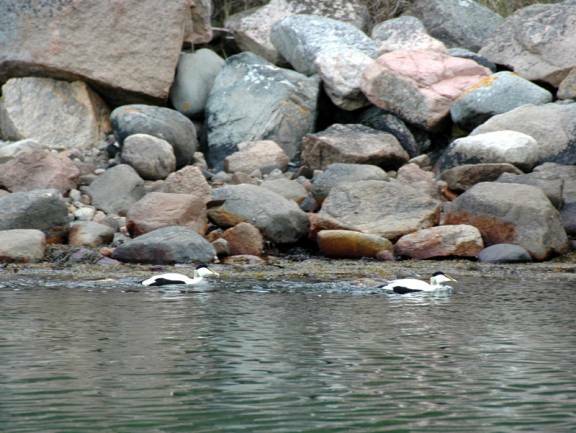 The Eiders (ducks) were in their spring garb. Last fall we saw these rather homely ducks in their drab brown-grey colour. Now the males have put on tuxedos for mating season; they are stark black and white. The females remain quite drab. The males resemble swimming or flying skunks! 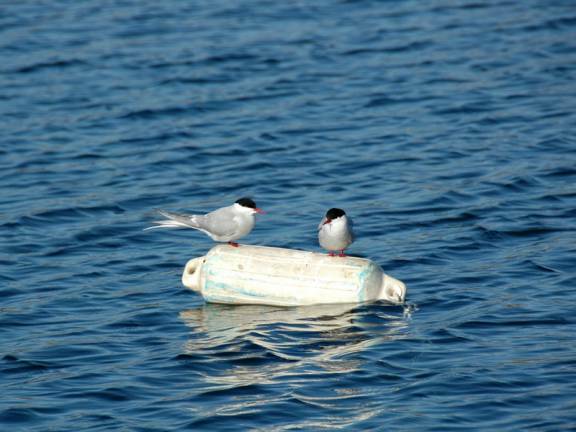 At our anchorage in Kalvö-Lindö two small terns found a comfy perch on our anchor float (an old small fender). We have no idea what they find attractive about it, but they look very cute balancing on it. We also heard our first cuckoo of the Spring and saw our first Oystercatchers, but they have not sung for us yet. The seagulls “meow” at us, and the mute swans just swim by majestically. We stopped in Strömstad, our northern-most Swedish port, to wait out strong winds and check out of Sweden (and the EU). With the exception of Norwegian boats that have special travel privileges few boats from outside the EU sail in these waters. The Customs Officials did not know how to check us out and after several phone calls it was decided there was nothing they needed to do. There is quite a diverse population in such a remote part of Sweden. 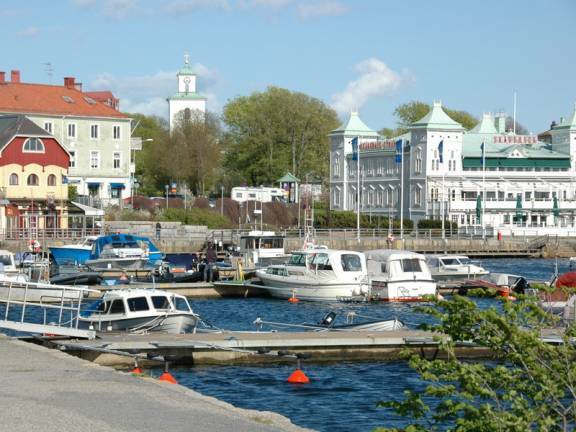 Aspects of Strömstad remind us of a summer resort town, since it is the jump-off port to the Koster islands for holidays. 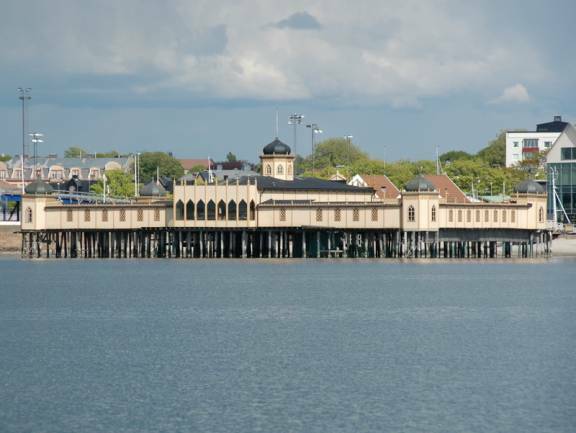 The town, like several other resort centres, had a bathhouse (kallbadhuset) built on a pier over the water. Such bathhouses have a combination of sauna and cold salt-water baths, dressing rooms and lounge areas; they were popular in Victorian times. 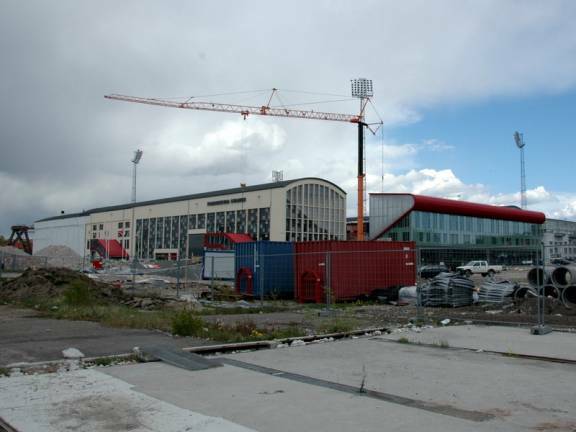 Also, Strömstad and several other close-by cities have large factory-outlet type malls for Norwegian shoppers. We are told that prices are very high in Norway, and those who live close to the border, shop in Sweden. If you live in Canada and have experienced “cross border shopping” times ten you will have an appreciation for what is being described. 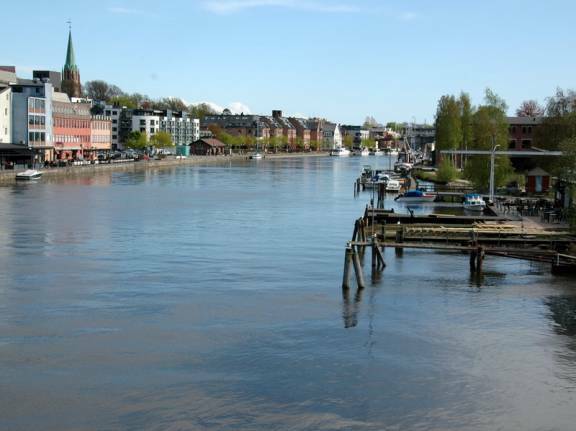 We went to Fredrikstad, the city closest to the Swedish border that had a Customs Office so that we could get an official document stating that Pilgrim had left the EU. 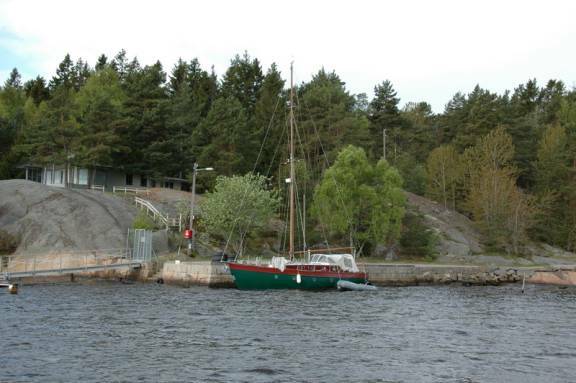 We docked at the local boat club, Nøkledypet Båtforening on the Glomma River and headed on foot to the Government building located on the other side of town. The customs officers did not know what to do with us. They no longer had any forms for visiting yachts, headquarters in Oslo was contacted before they finally ended up putting an official stamp with the date on our Crew Document to “prove” we had been out of the EU. We toured the main city as well as the old town and fortifications while waiting out strong winds. 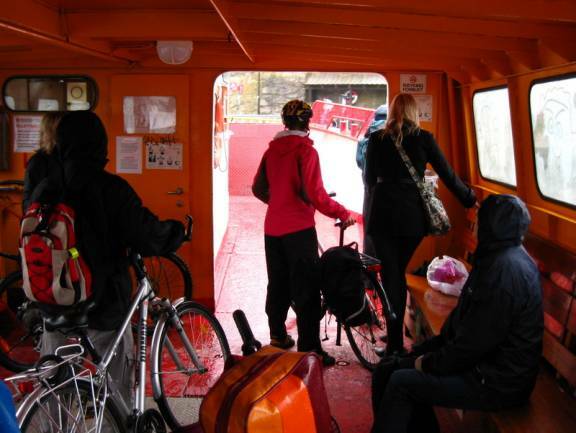 We took the pedestrian / bicycle ferry across the Glomma River to the old town, which was not too interesting. In the Tourist Information Centre we found a pamphlet on the fortifications, but the buildings were not open to the public. 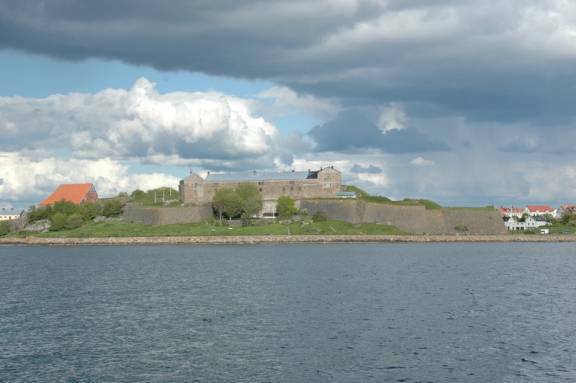 It was amazing to realize that this fortification (built by the Danes who were in power in Norway against the Swedes) was built in 1775, at the time of the American Revolution. We found the wine/spirits store and were amazed to see a throwback to the liquor outlets in Canada in the 1950s and early 1960s. One bottle of each item for sale was on display behind glass. Customers had to request what they wanted from clerks who went to the backroom to get what they wanted. At least the customers did not need to fill out a form and sign it, as we did in Canada in the mid-1960’s. 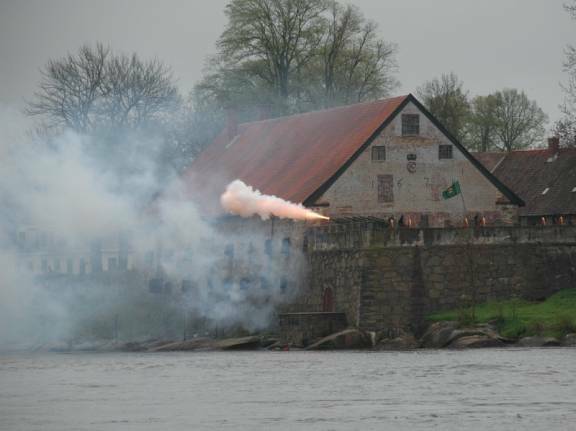 We also went to the fortifications near the boat club where we were docked, on the west side of the Glomma River. 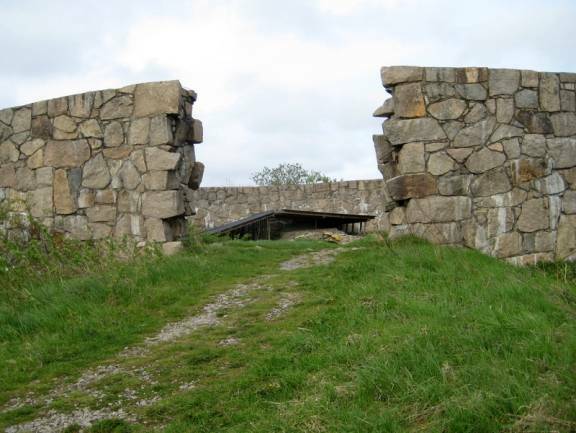 These fortifications were dynamited when they were abandoned, and are now being reconstructed by the University of Oslo Archeological Department. The military love to blow things up, archeologists love to put things back together … symbiotic? We spent a weekend at the Urdal anchorage on the north shore of Kirkøy island in the Hvler Islands just south of Fredrikstad waiting for the wind to shift to the north so that we could sail back south through the Swedish archipelago with the wind at our backs. South of the Gota River, the archipelago gives way to a coast with few anchorages. We stopped in Varberg, a charming town that is a vacation destination. 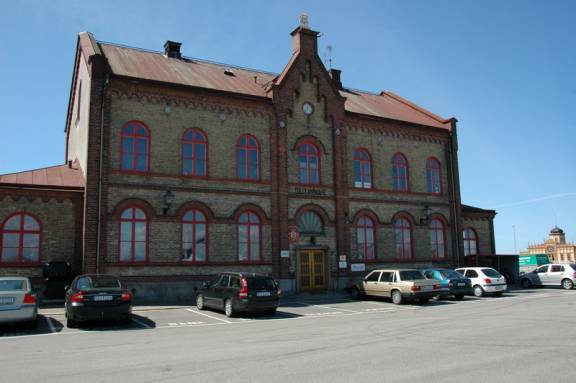 There is an elegant Victorian Kallbadhauset (sauna / bathhouse) near the harbour and an old railway station, which continues to be used for commuter trains. 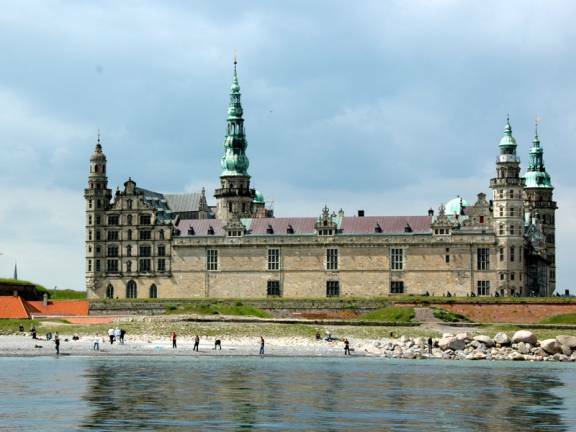 The Varberg castle/ fortress was built in the late 1500’s and expanded in the 1600’s, but after 1645 was not engaged in any battles. The fish market was well stocked with fresh and smoked fish and fish salads/ sandwiches. Some of the catch may have been local since the surrounding waters were full of fishing net floats and fishing boats were in the harbour. 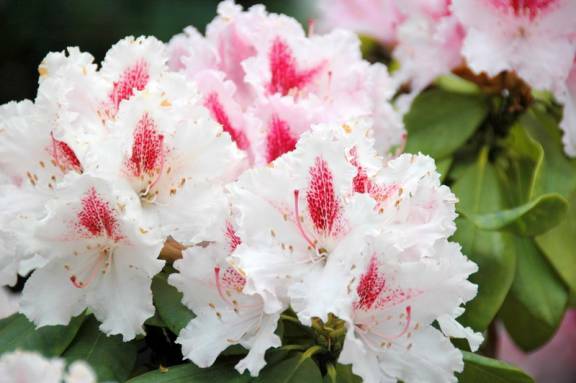 Varberg’s gardens were beautiful with rhododendrons, azaleas, pansies and tulips. 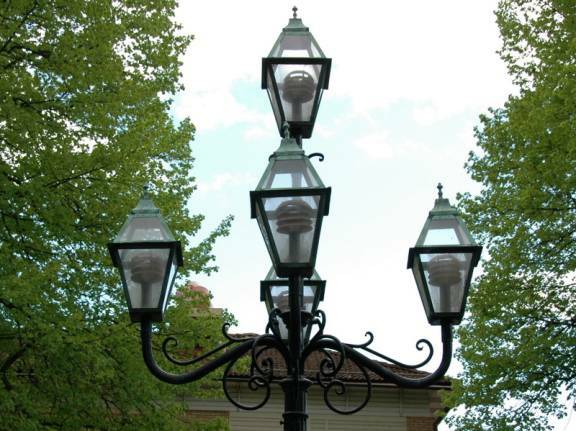 The parks had old-fashioned replicas of gaslights and the buildings had the look of the Victorian era, even the very modern college campus right at the harbour. There were many designated beaches in the area: some for women and children, some for men and some coed. 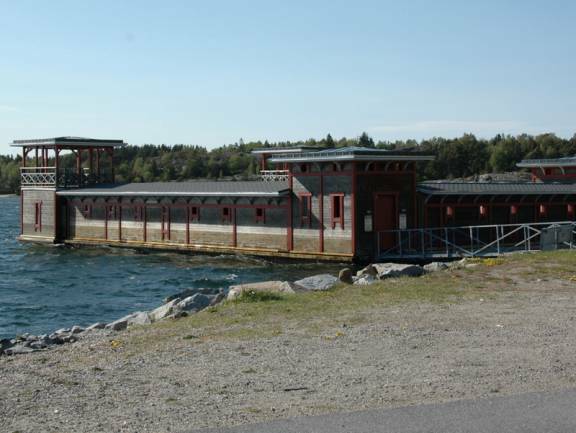 The customs house … right beside the docks … what an interesting concept … Norway wake up! 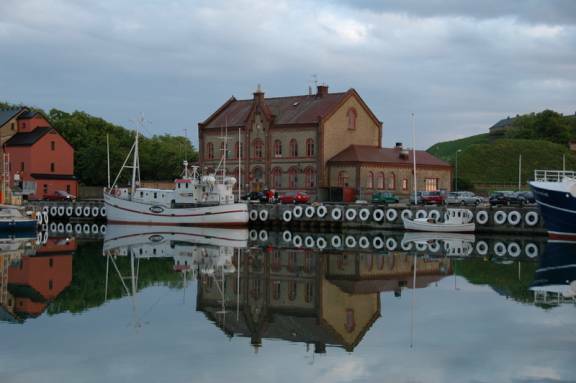 Halmstad was a harbour of refuge for us. The wind had clocked south, and our stop here was not planned, but it gave us welcomed shelter. 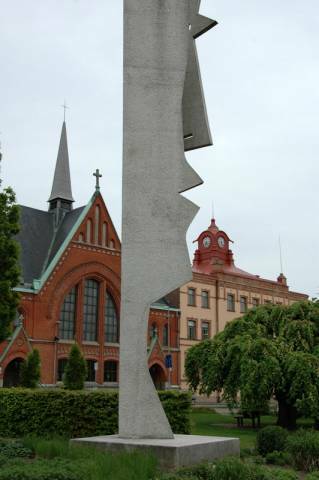 Halmstad was the city of bells for us. We were in this city on a Saturday evening and Sunday, so church bells could be anticipated. The bells seemed as much associated with tolling the hours and calling worshippers and there were bells in towers in secular buildings. 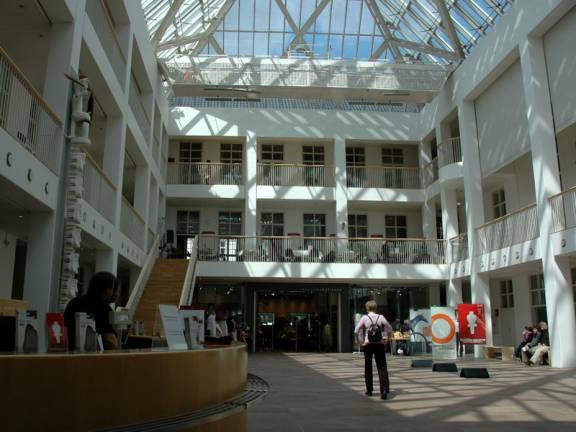 The city had old buildings as well as modern ones, such as the library that extended out over the river. 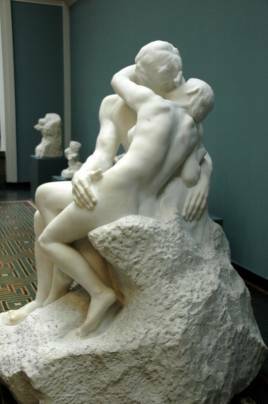 Likewise, sculpture was a combination of old bronzes and modern concrete structures. 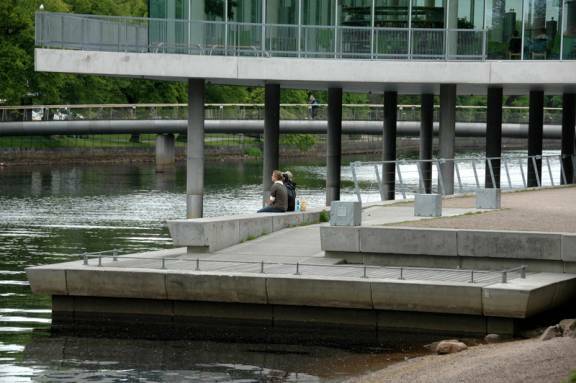 The walk along the river included playgrounds, unique benches and whimsical sculpture decorations. By the time we got to Denmark, the lovely warm spring weather had become more seasonal, and we had rain and strong winds every day in Denmark. Our first night we anchored just outside the harbour at Hornbæk, watched the local sailing club run practice races for the dinghies, and were hit with a dramatic rainsquall. There are no anchorages in The Sound (Sund) between Sweden and Denmark, and we learned the hard way that protection from the wind was less important than protection from the surge of passing ships. Our plan was to stop in Helsingor but when we got to the yacht harbour, we found the dock space very limited, especially for tying the boat “alongside” at a dock rather than trying to fit between poles or booms with no dock on either side, just a dock at the bow. We were waved-off one spot that seemed to be open by one of the resident boat owners. We backed out of the marina against a strong current and made our way to Skovshoved, just 5 miles north of Copenhagen. We stopped at the fuel dock since we needed fuel, but it also appeared to be the only open space for a boat our size, so we stayed there for the night and watched the local boats go out for a race. 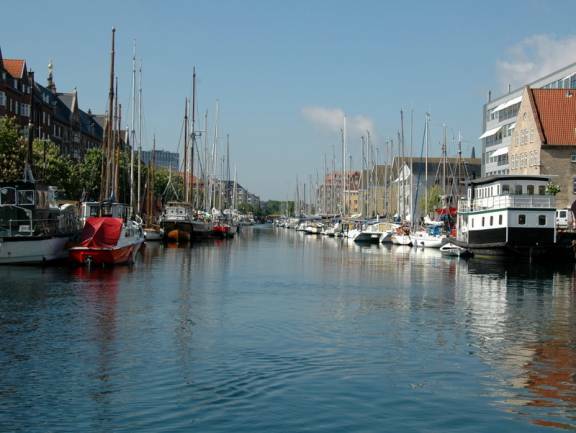 Based on our limited time in the Sound, cruising in Denmark is difficult … there are no anchorages in the east, there are large marinas, but very little docking that is suitable for a boat with our size and (lack of) maneuverability. 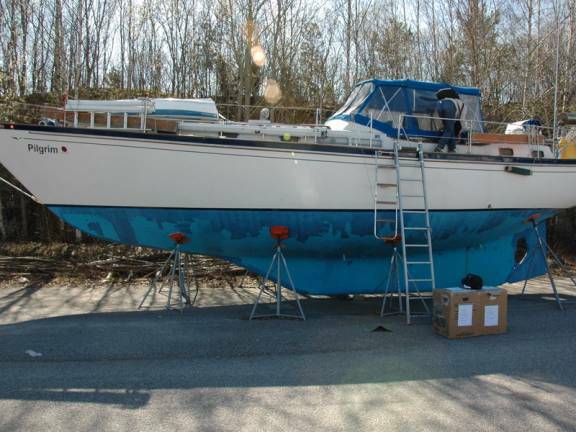 The harbormaster arrived in the morning, collected our dock fee and couldn’t suggest an alternative to the fuel dock. He would have been happy to have us stay longer. It seems that the fuel dock is not busy this time of the year. 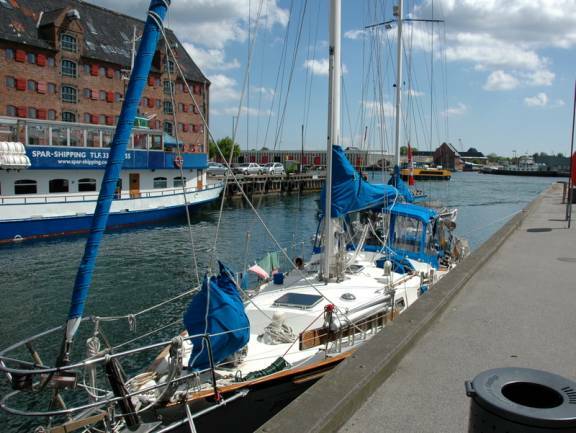 Options for mooring Pilgrim in Copenhagen are somewhat limited. 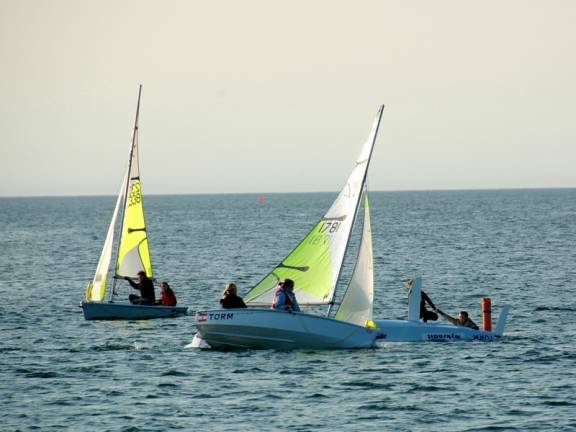 There are a couple of marinas, but the customary mooring style is to put your bow (front) straight on a dock and tie off the stern (back) to a buoy or a post. Getting on and off the boat when on a bow mooring is via the bow pulpit, which is too high a step (4 feet) from most docks for normal people. 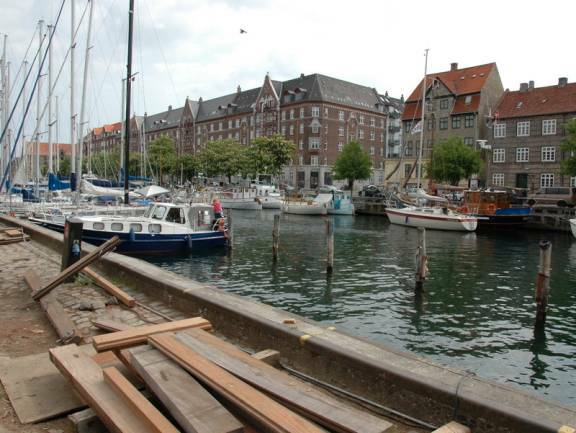 The Christianshavn Canal is a popular spot in the heart of Copenhagen, but when we slowly made our way down the canal and saw boats already rafted 3-deep, we decided not to venture down the narrow canal, and docked at Nyhavn instead. There are no services at Nyhavn… no water, no electricity, no showers, no toilets, just plenty of wandering tourists. However, we had enough water, used showers and toilets aboard, and generated our own power through the wind generator, solar panels, and the Honda (gasoline) generator. Several Canadian tourists and students dropped by to say hello. Canal tour boats with tours in German, Dutch or English, passed us constantly from 10AM until 7PM, but then the harbour became amazingly quiet. 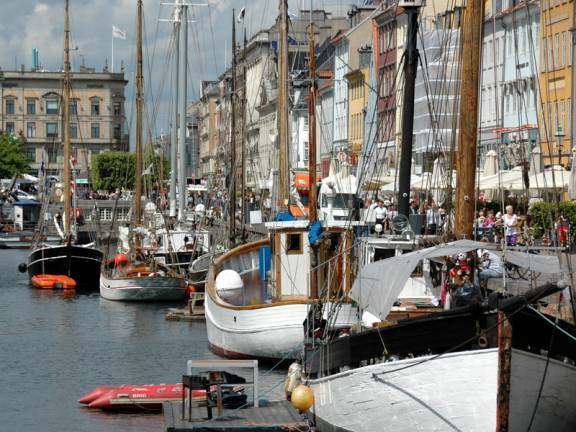 There were trendy cafés and pubs catering to tourists, a lightship museum, old canal barges in addition to the tour boats and other visiting yachts at Nyhavn. Oddly enough, we encountered a chartered boat from Germany that we had seen a year ago in Helgoland (off the west coast of Denmark/ north coast of Germany). The same group of men had chartered the boat again and recognized Pilgrim. They charter a boat annually for a guys week of sailing. 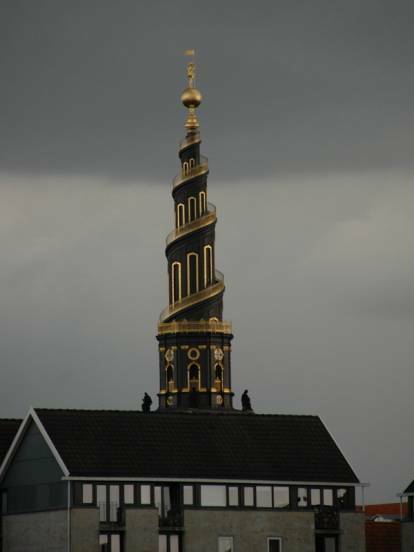 If Halmstad was the city of bells, Copenhagen is the city of spires. 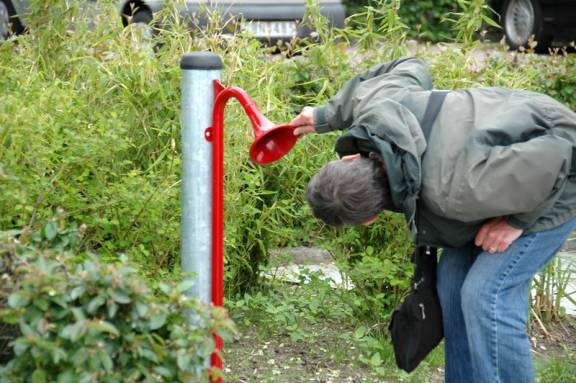 They are on churches, but also on many civic buildings. 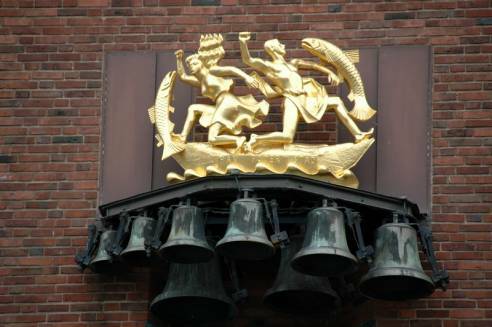 The Stock Exchange (Børsen) Tower is designed to look like four entwined dragon’s tails. 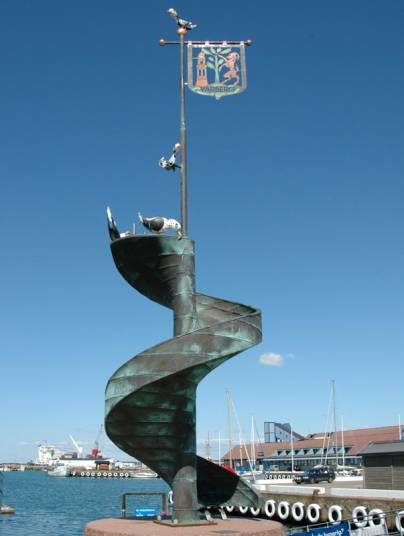 Vor Frelsers Kirke in Christianshavn has the twisted spire with the staircase outside the tower. 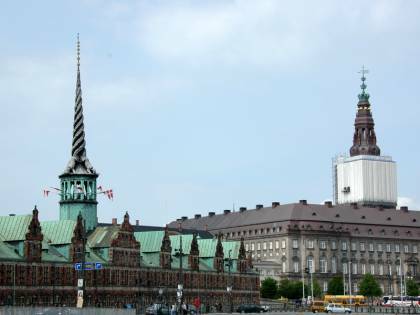 The tower on Christiansborg Slot (parliament) in Slotsholmen is the tallest in Copenhagen at 106 meters, 350 feet. 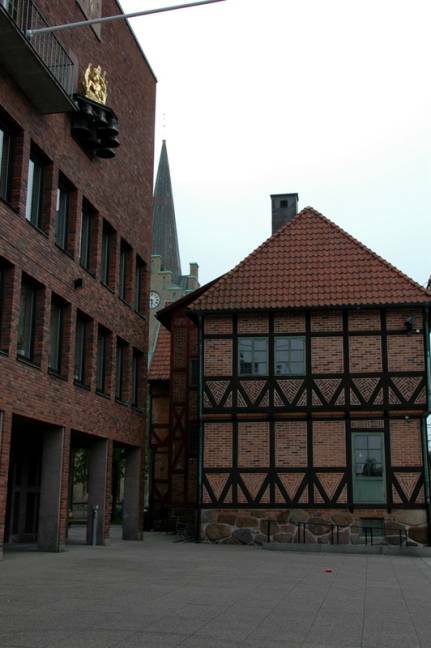 The tower on the Rådthuset (city hall) includes a clock. 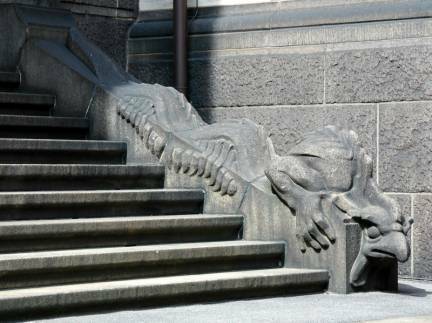 The building is guarded by fantastical sea creatures. 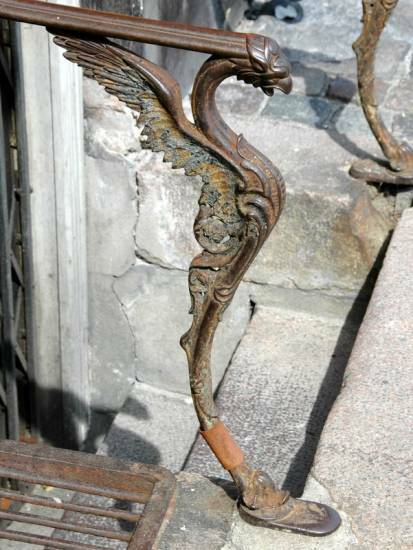 In fact, mythical griffons and other creatures guard many buildings in Copenhagen including staircases to houses. The Latin Quarter of the city is the home of the old university buildings. It is called “The Latin Quarter” because Latin used to be the common language in the university. Canals wind their way through the heart of the city. They may not be as numerous as the canals in Amsterdam, and the buildings along the canals do not seem to be leaning as much, but canals are a feature of Copenhagen. 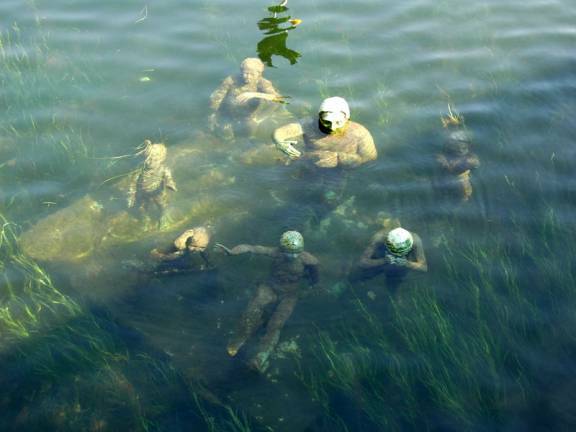 There is even one piece of sculpture in and under the canal’s waters depicting a merman and seven sons. 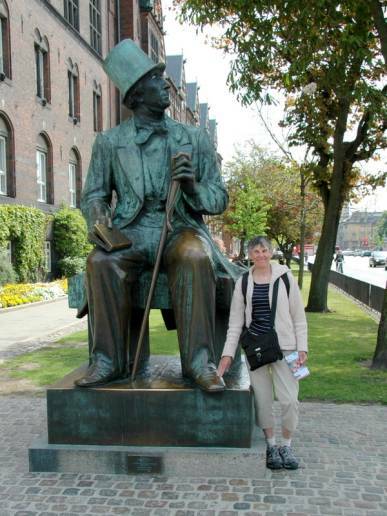 We associate Copenhagen with Hans Christian Andersen, and were surprised that there was not a stronger presence of the storyteller in the city. The only collection of memorabilia is owned and displayed by Ripley’s. 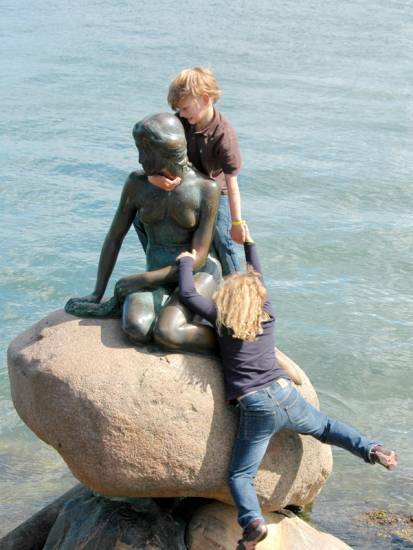 We found the elusive Little Mermaid (Lille Havfrue). She was vandalized several years ago and is now in a more secure location, but close enough to shore that tourists can still climb over and damage her. The Royal Pavilion, where the royals gather before going to their yacht, is close to the ornate palace with its sentry, accommodating to tourist photographers. 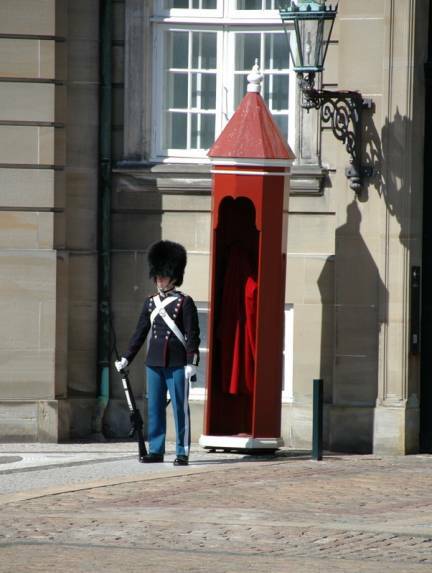 This guy had class … he did his sentry march until some young gals came by to take pics … He then took this pose while the shutters clicked. Why are there never any statuses for the folks who have to clean up after the horse? 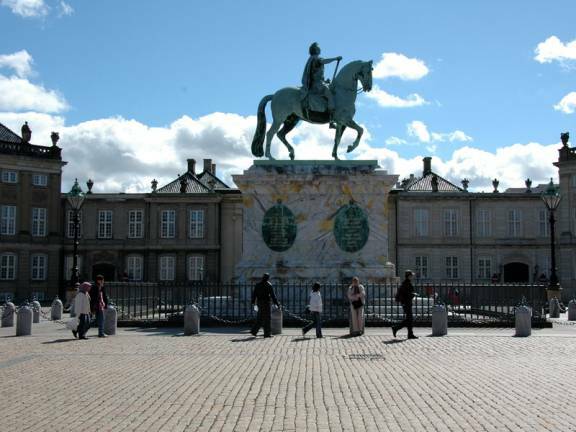 There were major demonstrations by Tamil Tigers near the Rådthuset and Christiansborg Slot. 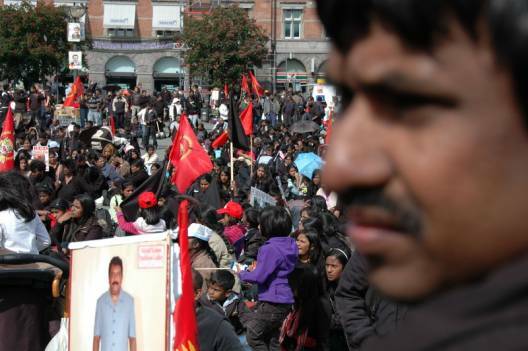 We suppose every major western city must have Tamil Tiger demonstrations; Toronto had them before we left in April. 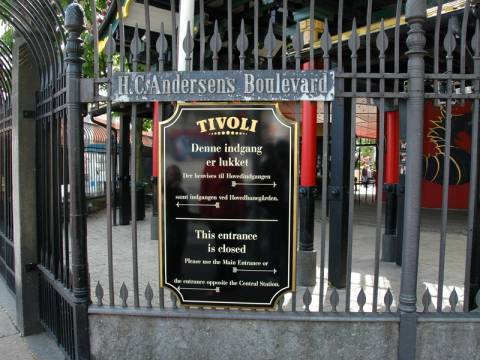 Copenhagen is famous for Tivoli Gardens, and we skirted the gardens during our walks, but did not go in. Jane had fond memories of a day in the gardens when she was an exchange student in 1961, when entrance may have been free. She also remembers her efforts trying to get drunk on Rum ice cream bars. 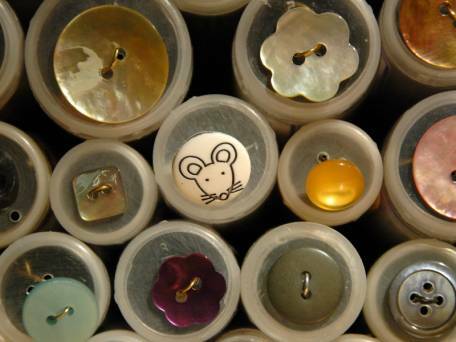 Jane was delighted with the yarn shops, one of which displayed painted wooden needles in cases and had the most charming buttons for sale in addition to yarn and other needlework. 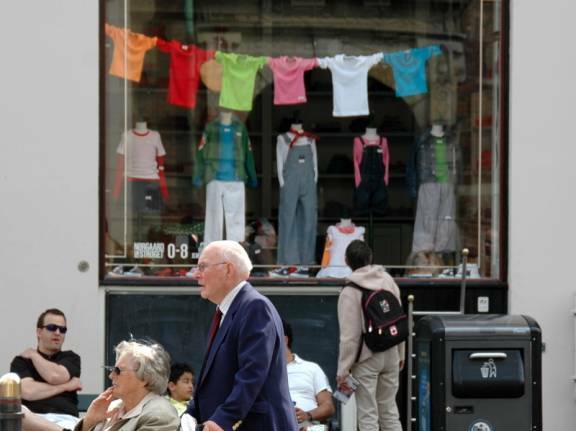 Jane doing the grandmother window-shopping thing … Now what will he be wearing in two years? 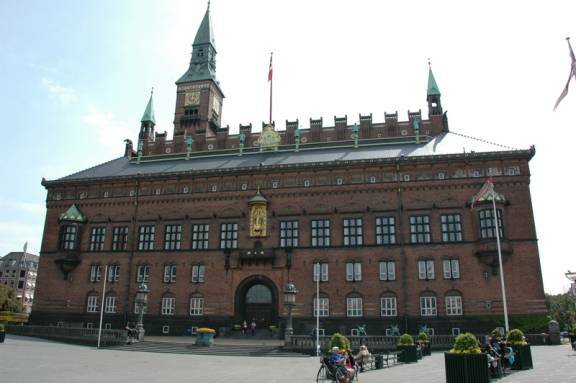 We spent time in two magnificent museums: The main building of the Nationalmusseet and the Ny Carlsberg Glyptotek. We spent most of our time in the Nationalmusseet in the Danish Prehistory (1300BC to 1050AD) gallery and were impressed by the display and the knowledge imparted with excellent descriptions and layout. 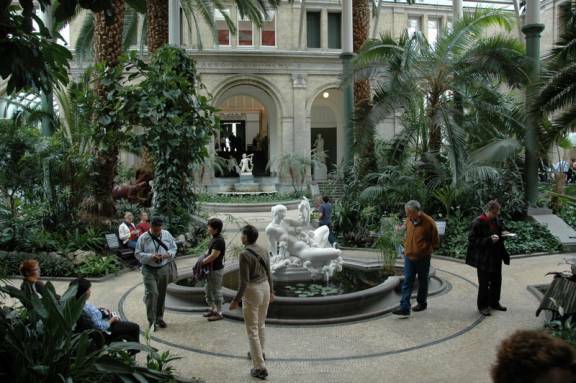 The Glyptotek was both a beautiful building (1906) and housed amazing collections. 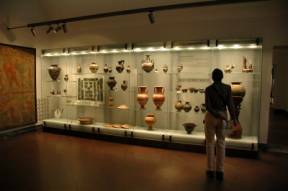 We spent half our time in The Ancient Mediterranean gallery. 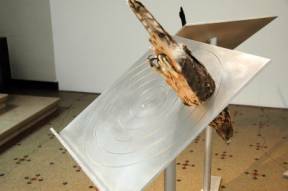 It covered the period 6000BC to 400AD, and displayed the household items (dishes, jewelry, tools, weapons) to demonstrate history. 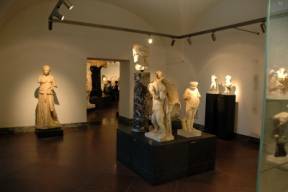 The collection was mainly acquired by Carl Jacobsen, brewing magnate (Carlsberg), with over 10,000 pieces with the main emphasis on the cultures of the ancient Mediterranean world as well as Danish and French art from the 19th and 20th centuries. Many pieces are not behind glass or roped off, leading us to ask how much of the collection was reproduction. None is. Pilgrim was docked two blocks from the Det Kongelige Teater, and we were able to get tickets to Rossini’s The Turk in Italy, sung in Italian with Danish surtitles. Luckily one did not need to know the plot line for this buffo comedy. The singing was good, some of the acting very good, and the design stunning. This was our first attendance at a performance in continental Europe. The audience applauded in unison … in rhythm no less …at the conclusion of the performance. Compared to the apparent randomness and individuality of the North American clap the sound had a strange appeal. 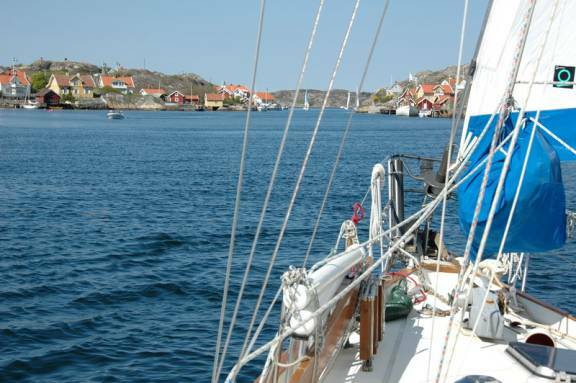 We left Copenhagen to go back to the south and east coasts of Sweden en route to St. Petersburg.